Whether it’s crafting films using vertical video or painting skateboards with exciting visuals, Mykim Dang, one of the recent STALKR filmmaker additions, is an artist of pure ingenuity. We had the chance to ask Mykim Dang some of our burning questions—from the inclinations of her process to the ways in which she balances mediums of craft, we were left with countless inspiring insights that truly capture the power of our fellow creatives. Can you remember the first moment you realized you wanted to be an artist? I’ve been making things across mediums for as long as I can remember. Growing up as a first generation Vietnamese American kid who bounced from place to place (my father was a contractor who flipped houses), creating art was a means of making sense of all that change—growing and learning from it. Very early on, I was focused on the idea that I could develop that interest into something bigger than myself, collaborate with and inspire others to do the same in terms of their own passions and mediums. As a multi-faceted creative, how does your work across mediums influence the way in which you create? I’m very much focused and interested in the process of self-expression. Whether that’s painting on skate decks, writing music, or shooting and editing stories around me—I’m just interested in manifesting something in one form or another. When you are driven by that idea—to create, to develop, to learn—the medium or the craft itself isn’t necessarily tied to an outcome or goal, which makes the creative process all the more invigorating. Is there a common thread that connects all of your creative endeavors? How do they all contribute to your identity as an artist? The thread for me is that much of my work has a handmade quality to it. I want you to feel a part of who I am when you interact with it. 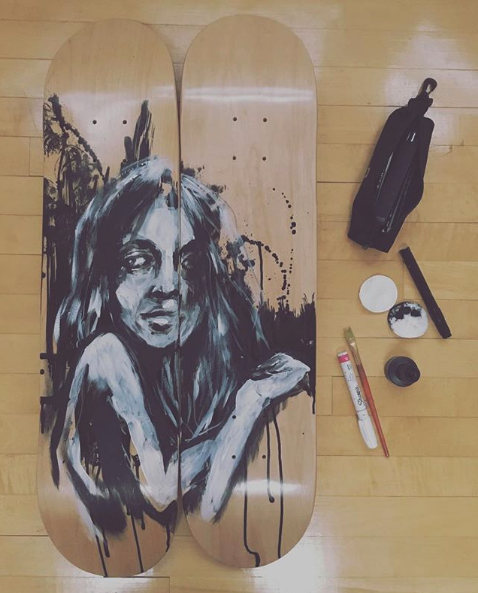 My decks are all created with traditional materials—paint, ink, pen; the shorts I make are typically myself handling every part of the production process. I also tend to chose mediums and subjects that become something different and transform once they are put in front of the audience. For example, will the decks I create be hung on a wall or skated? If I get enough feedback on a piece, I’ll likely release a re-edit, etc. I think it’s much more interesting to create and put work out there than holding onto it in your own corner of the world. How does the skateboarding community and culture inspire your work? Because I moved around so much as a kid growing up, I gravitated towards interests like skateboarding, comics and movies. At that time, skateboarding was primarily male-dominated. The friends and community I found through skating is a big part of my work, how I see the world, but I also wanted to contribute to that world in a different way, so that’s why I chose to infuse an unexpected visual identity into it by painting decks. The other thing about skateboarding, surfing, and snowboarding, which are also huge parts of who I am, is that they all have this common thread about interacting with the environment around you, persistence and undercurrents. So much of those tenants are at the core of how I operate, create, and make. What made you interested in vertical video? How did that format make you rethink your filmmaking process? I’m so excited that you asked this question! In looking back at my career since I graduated from film school, I’ve always tried to gather varying sources of inspiration to inform my creative process. Back in 2008, when digital was really nascent, I saw that as the future—so I shifted gears from traditional filmmaking and did everything I could to learn about these platforms (YouTube, Vimeo) where all the stories we were all going to tell would go. The same thing happened for me in 2016 when I started to notice that mobile devices were the new distribution wave. Two years ago, I had the opportunity to work at Facebook and Instagram, and that’s where I really learned the ropes and honed my knowledge and interest about the format and all its potential. I understand that many people are adverse to it, I myself was skeptical when I first started experimenting with it, but I think with any new disruption creative must find a way to adapt. Composition for vertical is so different from what we as filmmakers are used to, but learning how to be open and experiment with it will be the thing that allows us to keep making when the next thing comes along—because it inevitably will. Favorite project as of late? I’m really excited about the new wave of short form content I’m seeing on Tik Tok. I’ve recently started exploring the channels and platforms and I love all of the in-the-moment experimentation I am seeing on the daily. The #naturecam stuff is really accessible and fun, which is a contrast to some of the other material I tend to draw inspiration from or be influenced by. I’m currently working on a few different things at the moment—no surprise there right? 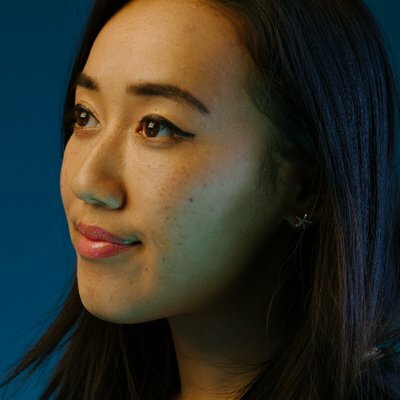 In addition to my day to day work, I have two side projects that are focused on exploring the way we adapt and tell our stories across platforms (Stories in Reverse) and a portrait series on makers (Handmade) that’s built for vertical. My goal with both projects is to build up a base of inspiration that gets other makers excited to make and also ask questions. I also recently finished recording a little EP with three songs and am working with a close group of friends and collaborators to shoot a vertical music video for it this spring.